Besides being my personal favorite social platform, Instagram is now considered the best platform for customer engagement. The photo-sharing social network now boasts over one billion users who add 95 million posts daily. Despite Instagram’s popularity, it’s not always clear how brands, especially B2B companies, should use the platform. When it comes to Contently’s Instagram, our social strategy is a lot more culture-focused than the rest of our platforms. We also post much more sporadically than we do on Facebook, Twitter, or LinkedIn. To help brands understand what works best on Instagram, social media analytics company Quintly conducted a study of 44,432 business profiles and over 8.9 million posts. Though a majority of posts were images, the study found that videos generate 21 percent more interactions. What’s also interesting is that carousels—posts that contain multiple images people swipe through—performed 2.2 percent better than single images. So if you have a whole album of stills after a company outing and you’re not sure which one to post, throw a bunch of them up for maximum engagement. Despite Instagram’s reputation as a visual place, the study also showed that 31 percent of posts included lengthy captions of 300 words or more. Captions are almost as integral to the post as the image or video itself. Only one percent of the posts surveyed were text-free, and 71 percent of the posts used at least one hashtag. As for our favorite little cartoon images? About 55 percent percent of accounts surveyed didn’t use emojisat all, while 35.8 percent used between one and four in mosts posts. As audiences become more accustomed to quality visual content, it’s important that brands don’t underestimate the impact Instagram can have. Whether your posts have long or short captions, slews of emojis or no images at all, your content needs to be original and honest to stand out among the millions of posts that users can come across every day. The budget came together, the shoot went smoothly, and the first cut gave you chills. You’re confident this great video will get people talking. Your audience will see it and want to become customers. Your customers will see it and want to spend more. So you post the clip on your company’s new YouTube page. You wait a few days to check the data and… your video got a whopping 12 views. This story is all too common for marketers. Unfortunately, hoping to go viral is not a video strategy. The online video space is a deeply crowded market. Everyone from big brands to middle schooler vloggers flood the space with content. Every minute, 400 hours of video are uploaded to YouTube. Marketers are taking notice of the boom, and they’re expected to spend $83 billion on online video this year just in the U.S. alone. That reality means your content will get lost without a clear video strategy. How do you break through the noise? It takes an adjustment in thinking. The painful truth is that there isn’t a single, magic method of finding an audience. Television networks and movie studios spend millions trying to pull audiences in and they still miss the mark all the time. Did you catch Melissa McCarthy in Happytime Murders? Yeah, neither did anyone else. Here are some nuances to think about to increase the odds your video gets seen by the right people. If you want to get your message out there, the first thing you should do is eliminate bad marketing habits. Start thinking like a wise TV executive, instead, and ask yourself a simple question: Would a person really watch this? We get caught up with target personas and product specs and optimizing for algorithms. Those factors all matter. But imagine your audience scrolling through their feeds and think about what would make them stop and watch. Then, consider what would keep them watching after a few seconds. Though it can be tempting to make a flashy video that runs through all the benefits and features of your product or service, our customers tend to see better results when they focus on the elements of good storytelling. Determine how you can show your brand, product, or service impacting people’s lives. In other words, focus on characters. Let them guide the narrative. That way, your videos can strike a balance between being informational and relatable. Eni, the global energy company, partnered with Contently on a video program to educate consumers who may not even know their lives are touched by the brand. For example, “Powering Mozambique,” the first documentary, told the story of how increased electricity and drinkable water in villages changed the day-to-day life for people living in the African nation. Better infrastructure impacted everything from healthcare to education to job training. To come up with these kinds of ideas, seek out video production talent with a strong portfolio of narrative videos that grab attention. They’ll be able to help develop storylines that emphasize the problems you solve. Getting attention is a good place to start. But the point of investing in content marketing is to hold attention, right? However, for some reason, there’s a strange dissonance between how we view written content and video content. It would be really strange to see a brand blog with one article. Content marketers publish there consistently. But when it comes to video channels, brands may only have a sparse page. It’s hard to break through with a one-off video. Take a look at successful YouTubers and Instagram influencers and you’ll notice one thing very fast: They post a lot of content on a regular schedule. Granted, budget plays a factor here. You can create a lot of blog posts if they each cost $500. You may only be able to set up one or two video shoots for $10,000. Even if that’s the case, you can still make a few smart tweaks to maximize your output. Once you know the parameters of your shoot, plan out multiple deliverables. If you are aiming for a 15-minute documentary with interviews, siphon off some of the footage for 30-second interviews with experts. Prepare 15-second clips for social distribution (more on this in a bit.) Maybe even split that original documentary into two or three parts. If you just have one video, the audience’s journey ends right there, even if they want to stay engaged. If you have even a small batch of interesting, relevant content on your site or social platforms, you provide your audience an incentive to stay and learn more about your brand. Remember that great video from the intro that only had 12 views? Here’s where you turn that 12 into 1,200, 12,000, or 120,000. Paid distribution on YouTube, Instagram, and other platforms ensures your content will be seen by the right audience. You can target ads based on location, industry, job title, and more. As the data comes in, you can optimize frequently to boost the efficiency of your ads. Short snippets, targeted the right way, can pull your audience in. Work with your video team to find ways you can utilize what you’re already created to craft some divisible content. Use these quick clips as promos that drive viewers to the meatier stuff on your channel or blog. When editing your videos, pay particular attention to the first couple of seconds of, well, everything. We make up our minds very quickly when deciding whether to watch something or click away. Ask yourself, would I keep watching this or would I skip ahead? Ask some trusted coworkers at your brand to weigh in. We do this a lot internally at Contently with our Content Marketing Minute videos. Since each clip only runs 60 seconds, they play well on social, racking up hundreds of views every time we post. Eventually, users became familiar with the series and took action by clicking through to existing content on our site. When you’re planning your video strategy, avoid the temptation to rely on the false promise of viral success. That’s like building your entire life around the idea that you might win the lottery. Instead, take the time to plan out a strategy that uses relatable, character-driven video, commits to consistency, and captures the attention of the right viewers with effective paid social. Test content and optimize your approach. Video content takes time, but when done well, it can invite and engage new audiences and help your message stick. Want to lower your Facebook ad costs? Looking to improve your Facebook ad targeting? In this article, you’ll discover three ways to build highly targeted Facebook audiences based on niche interests. Facebook is one of the biggest drivers of consumer spending/purchases online. In fact, the power of Facebook for eCommerce is growing year over year. Yet 62% of small businesses say Facebook ads don’t work for them. So why are a small portion of the online advertisers scoring huge but the majority are struggling? It all starts with the audience. 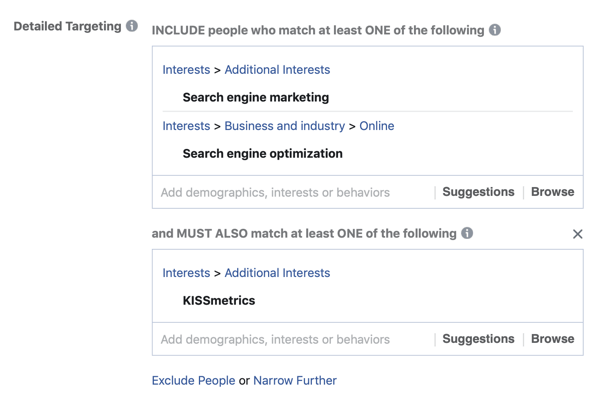 Anyone can go into Facebook’s Business Manager, create a new saved audience, and add Detailed Targeting interest criteria. Most marketers will start there, diving straight into creating a new Facebook ad audience from scratch. While custom audiences are ideal, you sometimes can’t access them initially or you can’t use them to reach more top-of-funnel people. Facebook often requires tons of testing and audience finagling to find targeting success. Standard interest and exclusions aren’t niched enough in most cases. Or sometimes they’re too niched. Take a look at the search engine optimization interest, for instance. There are more than 25 million people in this audience. Even sorting by demographics and excluding segments barely narrows your search. But when you start to target more niche sectors and industries that aren’t as popular, you don’t get very far. Not only are these industry segments too broad or too niche, they often aren’t accurate or specific enough. You may also be targeting old interests. Consider this scenario: Target X lands a job at a PPC agency and likes multiple PPC pages on Facebook. Two years later he quits his job to pursue another career, but he doesn’t take the time to unlike pages and deselect interests. Now you’re spending precious dollars to target someone who’ll never convert. According to AdStage, more small- to mid-sized brands are now advertising on Facebook, driving up prices as a result. In the first 6 months of analysis, they found a CPM increase from $4.12 to $11.17 and a CPC increase from $0.42 to $0.99. That’s a 2x increase in both cases. Also, the more users you target, the more your costs go up. That means it costs you more money to get the same results. So the old-school tactic of basic interests and exclusions to reach millions isn’t friendly to your acquisition costs anymore. Unless you have extremely high lifetime values for customers, you can’t afford the CPA anymore. Starting from a baseline instead of jumping into random interests might sound difficult, but think of audience building as a future sales machine, where CPAs fall as campaigns age. 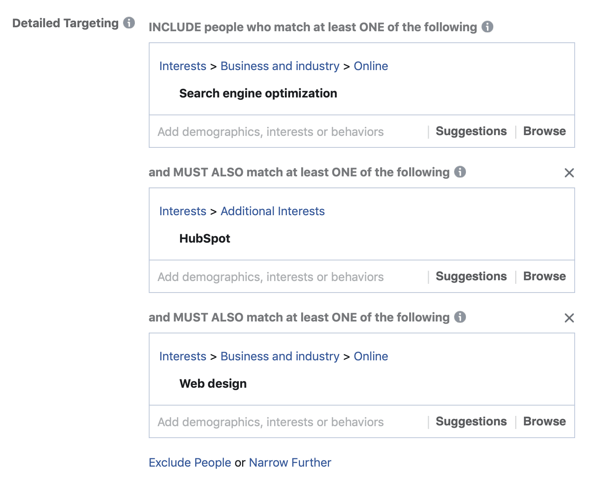 Now let’s look at three ways you can start building highly targeted Facebook audiences based on niche interests and keep your Facebook ad campaign budgets on track. Google Analytics can give you basic insights into interests related to your business. It offers a powerful report that shows multichannel attribution and specific sources. 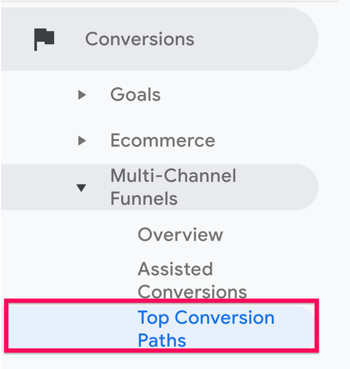 To access this report, open your Google Analytics and click Conversions > Multi-Channel Funnels > Top Conversion Paths. Next, select Source Path as your primary dimension and choose Landing Page URL Path as your secondary dimension. Move your date range back a few months to gather enough data for your analysis. Now check out your report. Look for anything that hints at interest patterns or trends such as websites, referrals, and where your traffic is coming from. You’ve compiled a list of related interests, companies, and groups all stemming from your inbound website traffic. You can plug these referrals and specific landing page interests from your multichannel report into a saved audience for your Facebook ad campaigns. So now you’ve narrowed your audience and double-layered your interests to MUST ALSO match, ensuring a hyper-targeted audience. Quora is a goldmine of data. In fact, Google queries in the B2B space often take you directly to Quora threads for the answer. Experience is the best teacher, as they say. And most of the answers to hot-button industry topics on Quora are from experts with decades of experience. Sure, Quora is often used as a simple marketing tool to spread brand awareness and get link clicks on answers. But it’s also helpful for finding answers, and more importantly, interests in a potential customer’s own words. After you sign in, search for a related topic (like PPC), problem, or solution and start to pick apart each post. You’ll quickly notice keywords within the topic, such as “negative keywords”. These are highly specific direct interests that you can use to narrow your audience beyond that topic. If you scroll down, you’ll uncover pages of valuable data. To illustrate, the two posts below shed light on possible revenue streams and customer information. In the first post, you can see high engagement for people who are into SEO but want to learn PPC. That’s a direct angle for interest targeting and shows an overlap between the two. 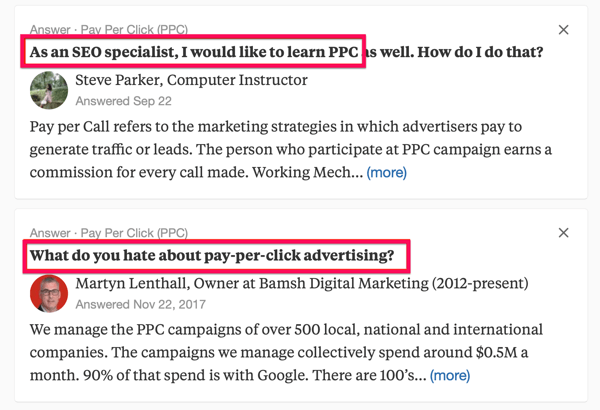 In the second post, you find a thread discussing specific PPC pain points. That’s curated interest targeting and ad copy for a Facebook ad campaign around the woes of PPC (and how your company can help). 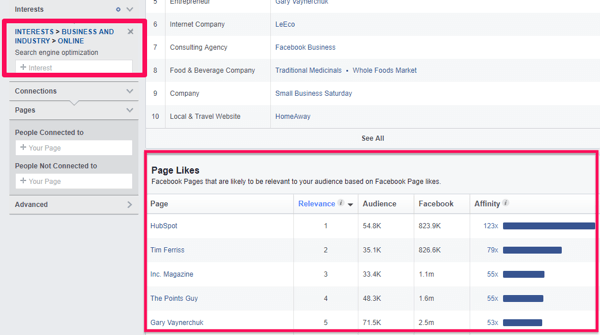 Another easy way to uncover audience data is within your Facebook Audience Insights. On the left side of the dashboard, add a new interest such as “search engine optimization.” Then at the top of the page, click the Likes tab to see a list of page likes from people who like search engine optimization. This info gives you a second targeting layer, and it only took a few seconds. Find pages with high affinity levels and repeat the process. For example, add HubSpot as an additional interest and see what you get. Using this process, you can double- or even triple-layer your interest targeting to ensure you’re getting the most current, active, and up-to-date users in your audience. Now repeat the process with the Analytics for your Facebook page. Navigate to People > Page Likes to see a report that ties specific page likes to categories. Go back to your saved audience builder and layer those interests as MUST ALSO Match and you can quickly narrow your audience. After you’ve created your Facebook audiences, you’ll want to test them for performance to see which gives you the best results. But skip the standard A/B testing methods (like testing two headlines or different images in your ads) because A/B testing doesn’t always work. Often, you’ll need 1,000 or more conversions a month before the results are statistically significant. Instead, try an A/B/N test that delivers different creative and page variations to your audiences. While an A/B test might change only a single variable like the headline, an A/B/N test is more general, allowing you to test entire offers or messaging across different pages. The landing page is modeled around a very niche interest. 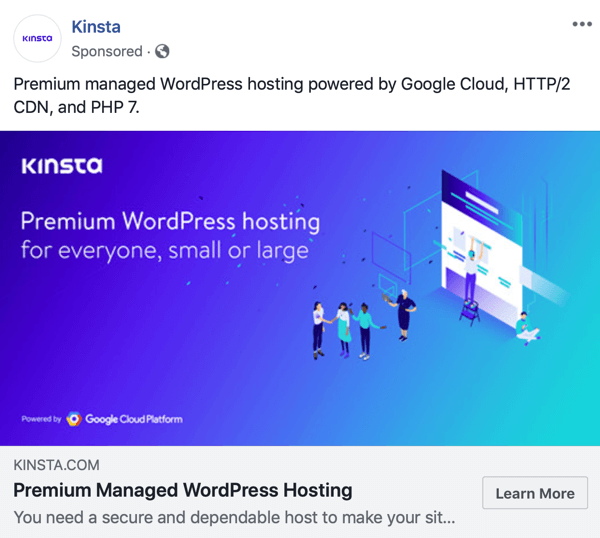 Kinsta runs multiple ads to multiple landing pages based on other interest-based audiences as well, such as enterprise-level hosting. Then they simply wait for people to visit their pages. 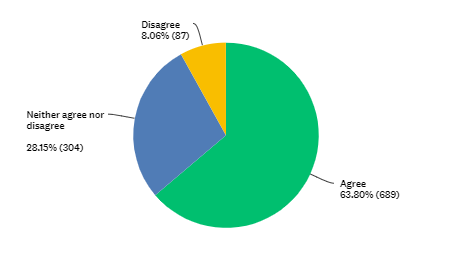 At the end of the test, they do a basic analysis to see which audience resonated with each interest. 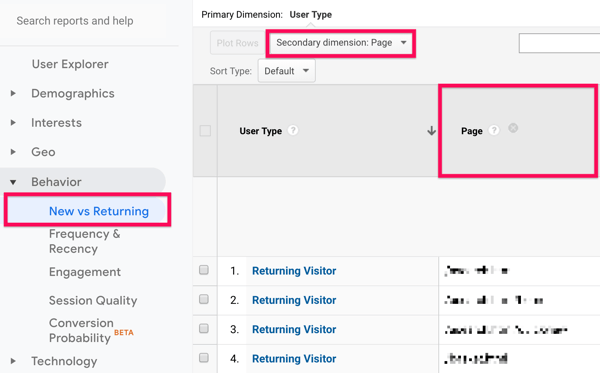 One way to analyze the results of your A/B/N testing is to look at your return traffic after a campaign to see that history on-site. To do this, open Google Analytics and navigate to Audience > Behavior > New vs Returning. 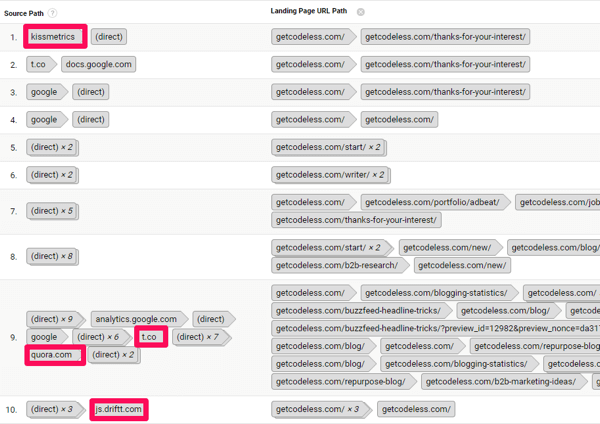 Then sort the data for when you ran your campaign and look at the pages the return traffic visited. Did any of those visitors return? What pages did they look at? What was the time on page and bounce rate? How many days after your campaign did they return? These are small signals that your audience could be vastly off or perfectly on target. If it’s not matching up, continue to refine it through the steps above. No platform matches Facebook’s demographic targeting. It has everything from interests to behavior to income and job seniority—it’s an advertiser’s dream. You can craft personas on the fly to target new audiences in just minutes. But the problem is, they aren’t all that accurate. Generalized interests can be vastly outdated or misrepresented. Just because someone visits a cosmetics Facebook page doesn’t mean they’re interested in makeup and want your product. Just like a person visiting a PPC page doesn’t mean they want generalized PPC tips. You have to narrow interests because Facebook lacks intent. You can’t just stop at page likes and call it a day. You have to go beyond general Facebook interests to get more clicks, leads, and conversions. The pitfalls of interest targeting on Facebook are extensive, but that doesn’t mean Facebook is a waste of time or should be abandoned. It’s still a cost-effective platform to reach amazing new audiences. 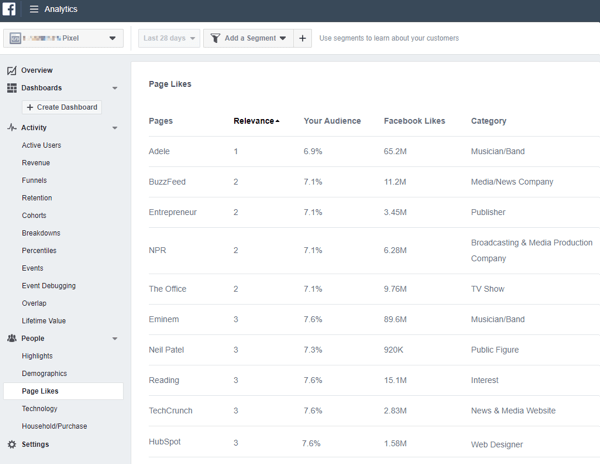 To get better results from your Facebook ad targeting, double- or triple-layer your interests, benchmark off other related companies, and get answers directly from prospects using Quora. Then test your different value propositions to sift past the dust and dirt, striking gold on your next ad campaign with a hyper-accurate audience. Do you need to do more than monitor and respond to mentions on social media? Looking for tools that also reveal strategic insights from those conversations? In this article, you’ll discover four social listening tools that deliver information you can use to make smart marketing decisions. Social listening is the process of listening to and analyzing conversations happening online about specific topics and keywords. While social media monitoring is about monitoring conversations happening on social media about your brand (or other topics), social listening allows you to dig much deeper. The scope is larger (you can “listen” across social media, blogs, forums, news sites, and more), and there’s a big focus on analyzing the data and extracting important insights that can help you improve your strategies. Now that you understand what social listening is, here’s a look at four social listening tools and how you can leverage them for your business. 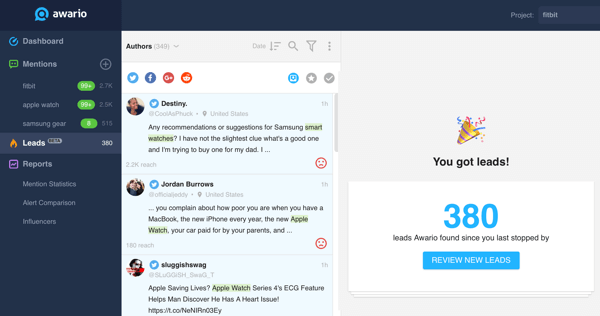 Awario is a pro social listening tool with a few extra features thrown in such as social selling (and lead generation) and social media management. 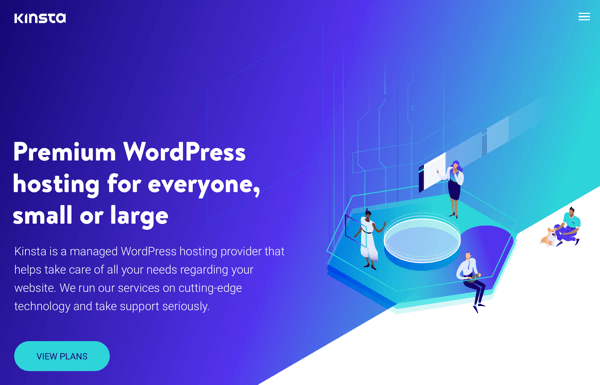 It’s built for businesses of any size but it has a lot of enterprise-ready features including sentiment analysis, influencer discovery, white-label reports, and mention maps, among others. Plans start at $29/month. When you set up a search query, Awario lets you use Boolean search operators to make sure your results will be highly targeted. To access this functionality when you set up an alert, click More Options in the alert setup window, as shown above. Then click Switch to Boolean Search at the bottom of the advanced search window. Now type in your search query to set up your alert. What specific keywords you want to track. You can add as many as needed. What keywords you want to avoid tracking. Any mentions that include those keywords will be removed from your results. What sources you want to focus your search on, if applicable. 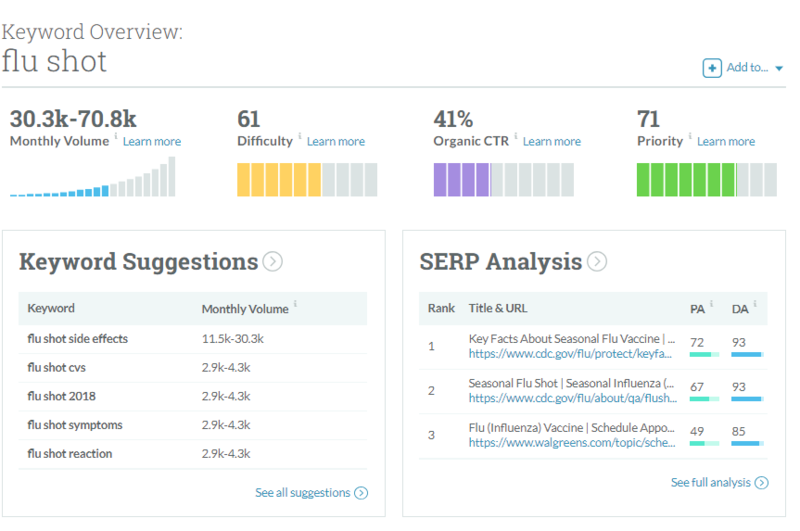 To further refine your keyword search, allow mentions that include your keywords even if the keywords are separated by other words; for example, “looking for help with my marketingstrategy, particularly for social media.” In this case, the keywords “social media marketing” are the main words being tracked. With this level of detail, you can make sure your searches are highly accurate and avoid unnecessary mentions that might influence your insights. Once your search is complete, use the platform to monitor your results in real time, discover relevant conversations happening in your industry, and set alerts so you’ll know as soon as an important mention requires your attention. As mentioned earlier, one way to leverage social listening tools is for social selling and lead generation. By closely monitoring conversations happening online, you can find opportunities to sell. To help with this, Awario introduced Awario Leads, a new module to their tool that helps you discover social media leads automatically. To use it, you first need to create your Leads project. 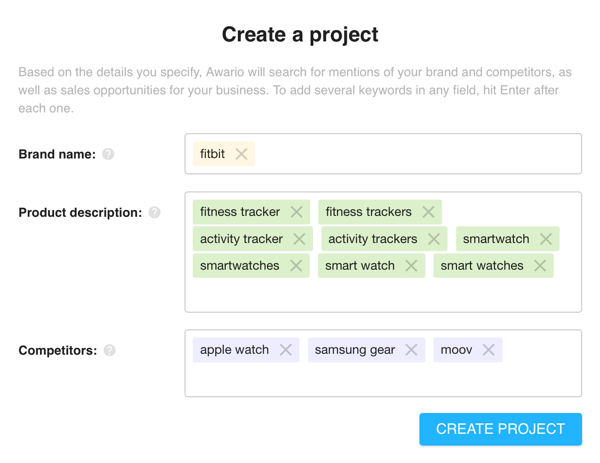 In the Create a Project window, enter the brand name, enter relevant keywords for the product description, and then name your main competitors to get started. Awario will then pull any relevant social media posts; for instance, any customers who are complaining about one of your competitors or people who are looking for product recommendations (products similar to what you’re selling). While Awario stands out for its powerful lead generation and social selling features, Brandwatch is the perfect solution if you’re more interested in the analytics and insights you can get for a search. This makes it an excellent tool for market research, as well as for generating more detailed audience and customer insights to improve your marketing strategies. Pricing information is available upon request. 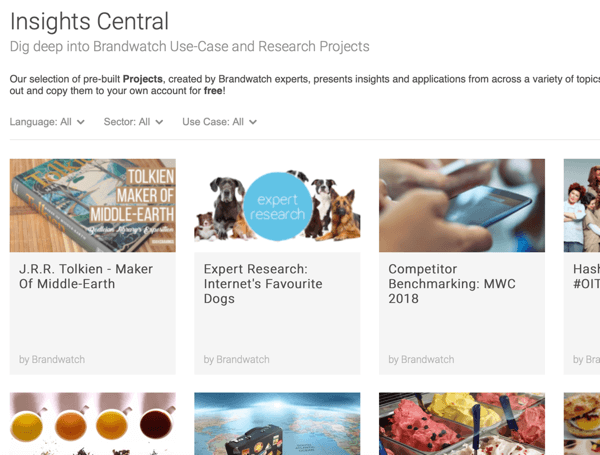 If you’re not sure where to start, Brandwatch offers Insights Central, a hub where you can find a plethora of pre-built projects for various sectors and industries. You can either use them as inspiration or copy the ones you need directly to your account. You also have the option to create your own search from scratch. As with Awario, use Boolean search if you want to filter your results. You can create multiple searches and track each one with its own dashboard. Brandwatch offers dozens of filtering options to further refine your search results. Plus, you can segment your data into different lists (such as by location or author) and create any kind of category you want (such as for grouping conversations based on customer profiles). In terms of insights, you get access to very detailed data. 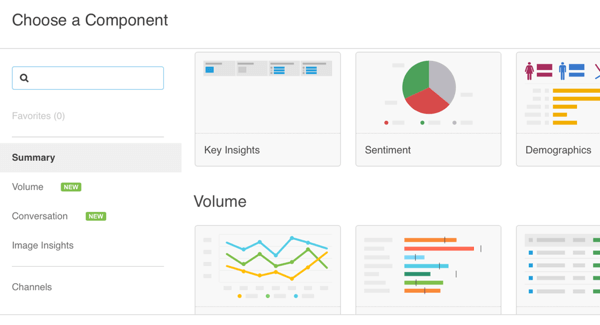 Brandwatch lets you add the components you want to build your own dashboard. Another feature that makes it stand out is image insights, which is “social media for images.” It will catch any images mentioning your brand (i.e., your brand’s logo) so you can act accordingly. Note that this is a separate module with different pricing. Talkwalker is social listening, social media analytics, and influencer marketing software that’s perfect for companies that operate at a global level and want to ensure their brand’s image is protected all over the world. Another way to use it is to monitor your social media KPIs and measure your social media success. Pricing starts at $9,600 yearly. Create a customized crisis dashboard where you can listen in real time and catch any mentions that need your attention. Immediately detect issues based on smart spike analysis. Whenever there’s a spike happening that you need to know about, the tool will immediately let you know about it. 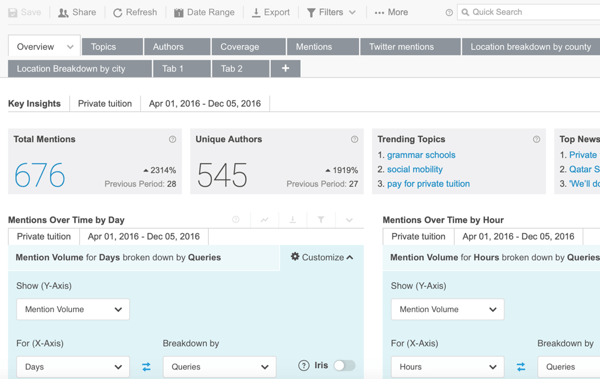 Analyze sentiment of mentions in 25 languages. 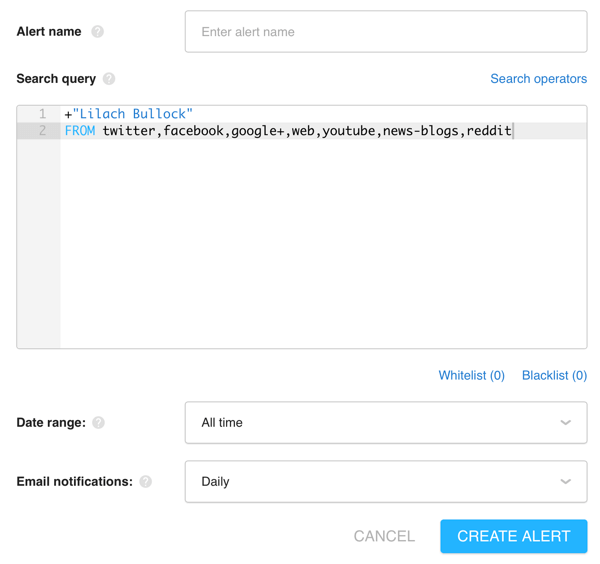 Create customized instant alerts so you’re immediately notified of any mentions, spikes, or trends that require your attention. Another feature that makes Talkwalker stand out is the focus on social media analytics, KPIs, and ROI. 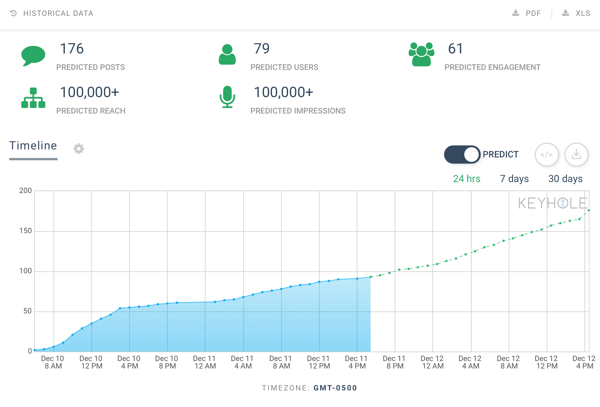 Use it to closely monitor your campaigns and hashtags, analyze the sentiment surrounding your brand and campaigns, and integrate it with Google Analytics to track your social media ROI. 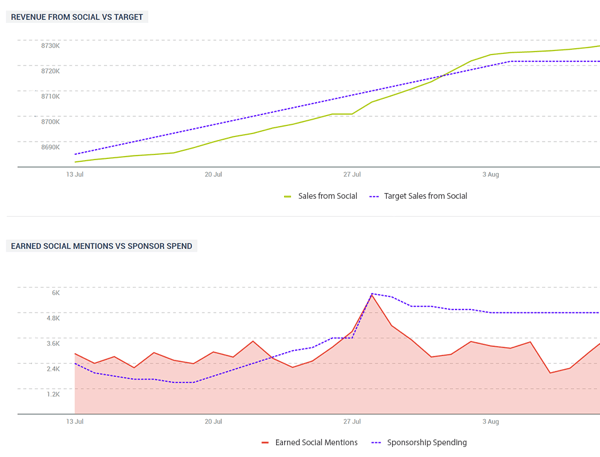 As you can see above, Talkwalker can even tell you the ROI you’re getting from social media (compared to your target sum or spending on sponsored content), as well as the revenue you’re generating. Keyhole is a social listening tool but it’s actually quite different from the other tools mentioned in this list. It focuses on monitoring marketing campaigns and hashtags across the web, but with an emphasis on social media channels. This makes it an excellent solution if you want to use social listening primarily for monitoring your marketing campaigns. Pricing starts at $199/month. 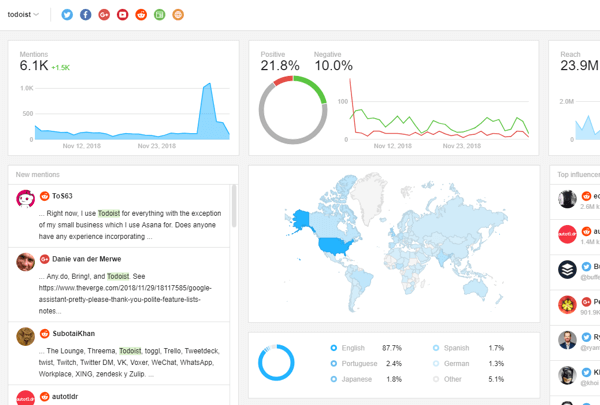 With Keyhole, you can track social media campaigns in real time with in-depth analytics. What’s more, the tool uses machine learning to help predict your campaign’s performance in the next day, week, or month. Based on past performance, Keyhole predicts the number of posts, users, engagement, reach, and impressions you can expect from your marketing campaigns. You can also use Keyhole to track your brand (or your competitors’) in real time across social media channels, news sites, blogs, and forums. It uses machine learning to help you manage your brand’s reputation. The algorithm can tell if there’s a sudden (or predicted) spike in the monitored activity, if someone complains about your brand, if an influencer you need to know about joins the conversation, or if a post starts going viral so you can catch it at the start. Another interesting feature is the event monitoring tool. Keyhole will catch and collect any mentions of your event in real time, as well as point out the most influential users talking about your event. Plus, you can even encourage event attendees to connect with other attendees and share content from the event (live-streaming videos, social media posts, and so on) with a Media Wall. Once the event is over (or even during the event), you’ll get access to your event stats and customizable reports. You can share these with anyone on your team, a manager, or your sponsors. At first glance, social listening may seem like it’s mostly a tool for monitoring brand mentions in real time. However, the truth is that it can help you achieve several goals, as mentioned above. But most importantly, it can provide in-depth insights about your industry and audience, and your own digital marketing strategies. In other words, social listening unlocks important insights and data. Leverage this data so you can ultimately improve your marketing results. 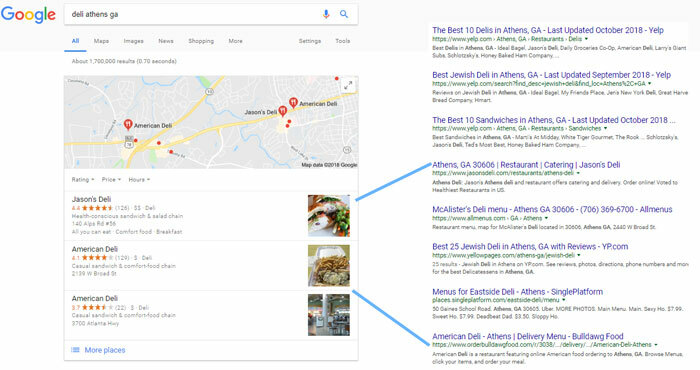 Within recent memory, a Google query with local intent brought up a big pack of ten nearby businesses, with each entry taking the user directly to these brands’ websites for all of their next steps. A modest amount of marketing effort was rewarded with a shower of Google gifts in the form of rankings, traffic, and conversions. Then these generous SERPs shrank to seven spots, and then three, with the mobile sea change thrown into the bargain and consisting of layers and layers of Google-owned interfaces instead of direct-to-website links. In 2018, when we rustle through the wrapping paper, the presents we find from Google look cheaper, smaller, and less magnificent. 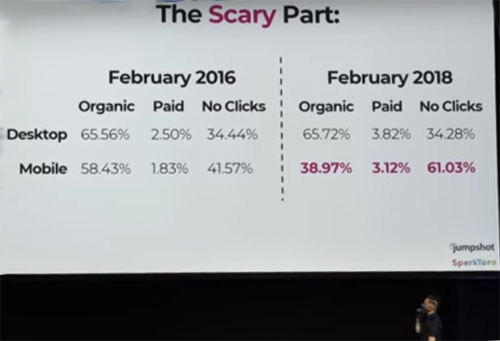 This slide from a recent presentation by Rand Fishkin encapsulates his findings regarding the growth of no-click SERPs between 2016–2018. Mobile users have experienced a 20% increase in delivery of search engine results that don’t require them to go any deeper than Google’s own interface. When Dr. Peter J. Myers surveyed 11,000 SERPs in 2018, he found that 35% of competitive local packs feature ads. At last count, Google’s Local Service Ads program via which they interposition themselves as the paid lead gen agent between businesses and consumers has taken over 23 business categories in 77 US cities. When a user specifically searches for your brand and your Google Knowledge Panel pops up, you can likely cope with the long-standing “People Also Search For” set of competitors at the bottom of it. But that’s not the same as Google allowing Groupon to advertise at the top of your KP, or putting lead gen from Doordash and GrubHub front and center to nickel and dime you on your own customers’ orders. As highlighted at the beginning of this post, 64% of marketers agree that Google is becoming the new “homepage” for local businesses. This concept, coined by Mike Blumenthal, signifies that a user looking at a Google Knowledge Panel can get basic business info, make a phone call, get directions, book something, ask a question, take a virtual tour, read microblog posts, see hours of operation, thumb through photos, see busy times, read and leave reviews. Without ever having to click through to a brand’s domain, the user may be fully satisfied. There are many more examples we could gather, but they can all be summed up in one way: None of Google’s most recent local initiatives are about driving customers to brands’ own websites. Local SERPs have shrunk and have been re-engineered to keep users within Google’s platforms to generate maximum revenue for Google and their partners. 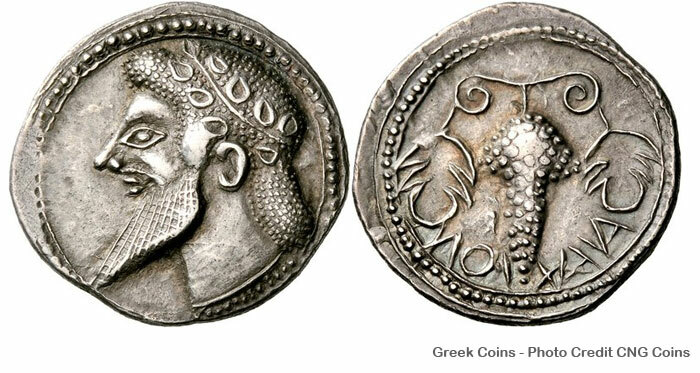 You may be as philosophical as Epicurus about this and say that Google has every right to be as profitable as they can with their own product, even if they don’t really need to siphon more revenue off local businesses. But if Google’s recent trajectory causes your brand or agency to conclude that websites have become obsolete in this heavily controlled environment, please keep reading. How often do the top 3 Google local pack results also have a 1st page organic rankings? In a small study, we looked at 15 head keywords across 7 US cities and towns. This yielded 315 possible entries in Google’s local pack. Of that 315, 235 of the businesses ranking in the local packs also had page 1 organic rankings. That’s a 75% correlation between organic website rankings and local pack presence. 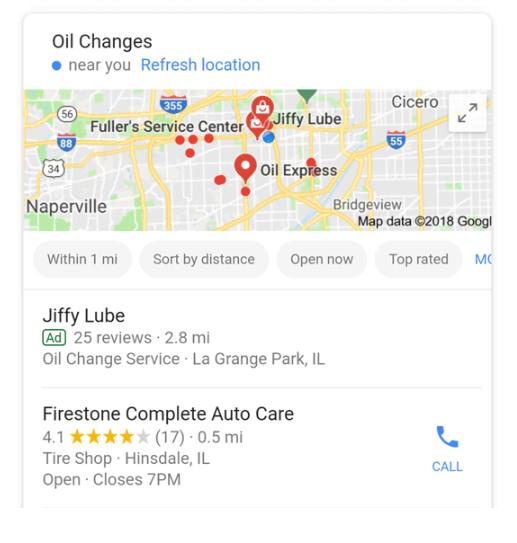 *It’s worth noting that where local and organic results did not correlate, it was sometimes due the presence of spam GMB listings, or to mystery SERPs that did not make sense at first glance — perhaps as a result of Google testing, in some cases. Additionally, many local businesses are not making it to the first page of Google anymore in some categories because the organic SERPs are inundated with best-of lists and directories. Often, local business websites were pushed down to the second page of the organic results. In other words, if spam, “best-ofs,” and mysteries were removed, the local-organic correlation would likely be much higher than 75%. Further, one recent study found that even when Google’s Local Service Ads are present, 43.9% of clicks went to the organic SERPs. Obviously, if you can make it to the top of the organic SERPs, this puts you in very good CTR shape from a purely organic standpoint. The local businesses you market may not be able to stave off the onslaught of Google’s zero-click SERPs, paid SERPs, and lead gen features, but where “free” local 3-packs still exist, your very best bet for being included in them is to have the strongest possible website. Moreover, organic SERPs remain a substantial source of clicks. Far from it being the case that websites have become obsolete, they are the firmest bedrock for maintaining free local SERP visibility amidst an increasing scarcity of opportunities. This calls for an industry-wide doubling down on organic metrics that matter most. Moreover, a recent audit of 9,392 Google My Business listings found that 27% have no website link. In an environment in which websites are table stakes for competitive local pack rankings, virtually all local businesses not only need one, but they need it to be as strong as possible so that it achieves maximum organic rankings. What makes a website strong? For our present purpose, let’s take a special look at those last three elements. What we’re describing here isn’t a set of disconnected efforts. It’s a single effort that’s integral to researching, writing, and publishing the website. Far from stuffing keywords into a tag or a page’s content, focus has shifted to building topical authority in the eyes of search engines like Google by building an authoritative resource for a particular consumer demographic. The more closely a business is able to reflect customers’ needs (including the language of their needs), in every possible component of its website, the more relevant it becomes. The medical clinic need not compete nationally for these topics, but at a local level, a page on the website can answer nearly every question a nearby patient could have about this subject. The page, created properly, will reflect human language in its tags, headings, descriptions, text, and markup. It will tell all patients where to come and when to come for this procedure. It has the potential to cut down on time-consuming phone calls. And, finally, it will build topical authority in the eyes of Google to strengthen the clinic’s chances of ranking well organically… which can then translate to improved local rankings. It’s important to note that keyword research tools typically do not reflect location very accurately, so research is typically done at a national level, and then adjusted to reflect regional or local language differences and geographic terms, after the fact. 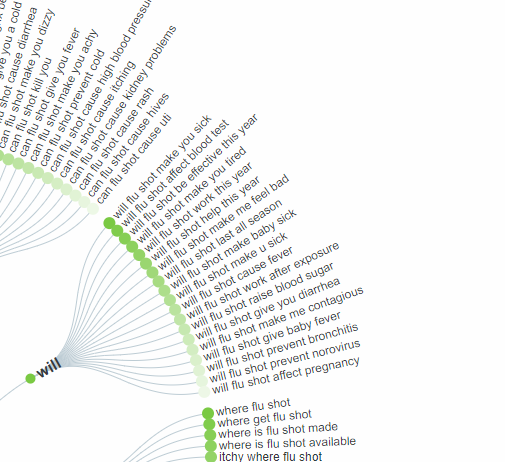 In other words, a keyword tool may not accurately reflect exactly how many local consumers in Dallas are asking “Where do I get a flu shot?”, but keyword and real-world research signals that this type of question is definitely being asked. The local business website can reflect this question while also adding in the necessary geographic terms. 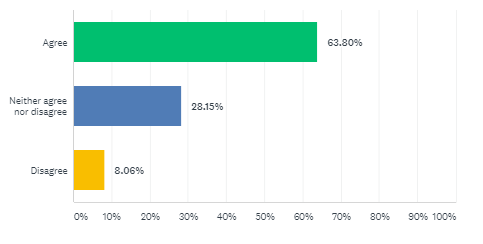 Moz’s industry survey found that more than one-third of respondents had no local link building strategy in place. 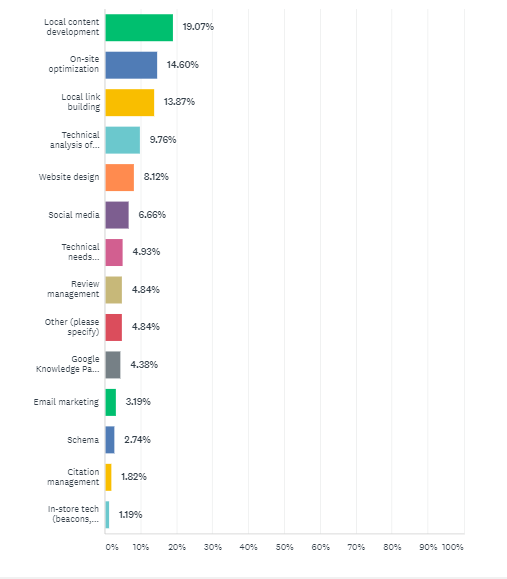 Meanwhile, link building was listed as one of the top three tasks to which marketers want their clients to devote more resources. There’s clearly a disconnect going on here. Given the fundamental role links play in building Domain Authority, organic rankings, and subsequent local rankings, building strong websites means bridging this gap. First, it might help to examine old prejudices that could cause local business marketers and their clients to feel dubious about link building. These most likely stem from link spam which has gotten so out of hand in the general world of SEO that Google has had to penalize it and filter it to the best of their ability. Not long ago, many digital-only businesses were having a heyday with paid links, link farms, reciprocal links, abusive link anchor text and the like. An online company might accrue thousands of links from completely irrelevant sources, all in hopes of escalating rank. Clearly, these practices aren’t ones an ethical business can feel good about investing in, but they do serve as an interesting object lesson, especially when a local marketer can point out to a client, that best local links are typically going to result from real-world relationship-building. There are so many ways a local business can build genuine topical and domain authority in a given community by dint of the relationships it develops with neighbors. An excellent way to get started on this effort is to look at high-ranking local businesses in the same or similar business categories to discover what work they’ve put in to achieve a supportive backlink profile. 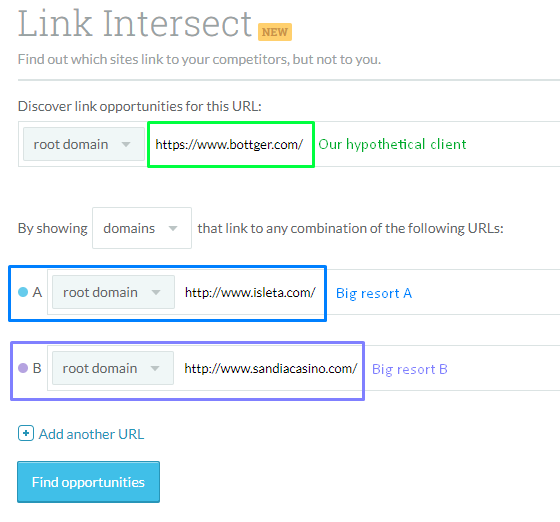 Moz Link Intersect is an extremely actionable resource for this, enabling a business to input its top competitors to find who is linking to them. The small B&B can then try to earn a spot on that same page, because it hosts lavish tea parties as a thing-to-do. Outreach could depend on the B&B owner knowing someone who works at the local Marriott personally. It could include meeting with them in person, or on the phone, or even via email. If this outreach succeeds, an excellent, relevant link will have been earned to boost organic rank, underpinning local rank. Then, repeat the process. Aristotle might well have been speaking of link building when he said we are what we repeatedly do and that excellence is a habit. Good marketers can teach customers to have excellent habits in recognizing a good link opportunity when they see it. Without a website, a local business lacks the brand-controlled publishing and link-earning platform that so strongly influences organic rankings. In the absence of this, the chances of ranking well in competitive local packs will be significantly less. Taken altogether, the case is clear for local businesses investing substantially in their websites. You’ve now determined that strong websites are fundamental to local rankings in competitive markets. You’ve absorbed numerous reasons to encourage local businesses you market to prioritize care of their domains. But there’s one more thing you’ll need to be able to convey, and that’s a sense of urgency. Right now, every single customer you can still earn from a free local pack listing is immensely valuable for the future. This isn’t a customer you’ve had to pay Google for, as you very well might six months, a year, or five years from now. Yes, you’ve had to invest plenty in developing the strong website that contributed to the high local ranking, but you haven’t paid a penny directly to Google for this particular lead. Soon, you may be having to fork over commissions to Google for a large portion of your new customers, so acting now is like insurance against future spend. For this to work out properly, local businesses must take the leads Google is sending them right now for free, and convert them into long-term, loyal customers, with an ultimate value of multiple future transactions without Google as a the middle man. And if these freely won customers can be inspired to act as word-of-mouth advocates for your brand, you will have done something substantial to develop a stream of non-Google-dependent revenue. This offer may well expire as time goes by. When it comes to the capricious local SERPs, marketers resemble the Greek philosophers who knew that change is the only constant. 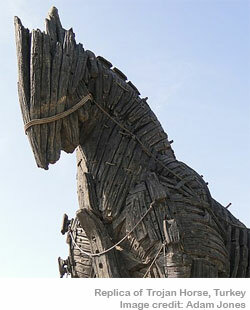 The Trojan horse has rolled into every US city, and it’s a gift with a questionable shelf life. We can’t predict if or when free packs might become obsolete, but we share your concerns about the way the wind is blowing. What we can see clearly right now is that websites will be anything but obsolete in 2019. Rather, they are the building blocks of local rankings, precious free leads, and loyal revenue, regardless of how SERPs may alter in future.